Author Aileen Avery is a real gift-giving expert who has studied and written about both the psychology and even the history behind the art of gift giving. 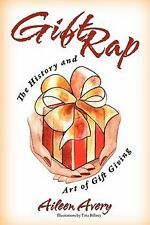 In fact, her popular gift book is called GIFT RAP: The History and Art of Giving. Avery’s impressive research reveals the historic origins of our gift-giving holidays. For instance, Mother’s Day originated in ancient Greece with Spring festivals that honored Rhea, the mother of all gods and men. It wasn’t until 1908 when Anna Jarvis of Grafton, West Virginia, convinced her church to honor mothers on the death of her own mother. That simple gesture took off, and six years later Mother’s Day was declared a national holiday celebrated on the second Sunday in May. The only sure bet this Mother’s Day is that most of will struggle to find the perfect gift, and that phones will be ringing off the hook call mom on Mother’s Day. 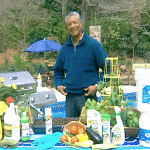 Avery is an experienced show host and co-hosted the HGTV show “I WANT THAT!” which highlighted the hottest “must-haves” products for the home. 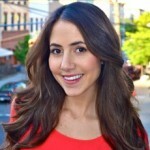 Aileen is also the creator of the site www.giftexpert.org, which features excerpts from her book and gift advice. Moms love flowers, but I like to take that a step further. My mom, for example is one of the moms who loves to garden, and a gorgeous container of bright cool wave pansies make for a great gift. Wave Petunias are great because their easy spreading color trailing make decorating a breeze and they’re low maintenance. One of my favorite things to do with Wave Petunias is use unconventional containers, craft decorations, or reclaimed items from the outdoors to personalize the gift even more. With Wave petunias you can create a gorgeous floral container with mom. Cool Wave Pansies make decorating a breeze because they come in gorgeous spring colors and easily spread and trail. You can easily make tablescape or patio displays for mom. Plus, they’re easy to maintain, so it’s a gift that mom doesn’t have to worry too much about. Every mom loves to get pictures of their kids and grandkids, but if you want to surprise her with something different, how about a classic television series to take her back to days gone by? Just in time for Mother’s Day, I LOVE LUCY – ULTIMATE SEASON ONE, THE ANDY GRIFFITH SHOW – SEASON ONE and THE HONEYMOONERS – “CLASSIC 39” EPISODES will debut on Blu-ray for the first time ever! Moms will love reliving these classic comedies in sparkling high-definition and checking out the extras like home movies with Lucy & Desi on the set or candid film shot by Ron Howard’s dad behind-the-scenes on The Andy Griffith Show. All three collections are going to be available for the suggested retail prices of $130.00 each. Why do we give gifts at Christmas? Or for birthdays and weddings? The answer has more to do with history and ritual than mere thoughtful and romantic ideas. Explore the traditions behind gift giving holidays in "Gift Rap: The History and Art of Gift Giving." Think outside the box and take the stress out of finding the perfect present! 1. Know your target – this seems like a no-brainer, but sometimes we take people for granted. We can know them for years and never know what their favorite color, food, or TV show is. Whenever I'm with someone, be it friend, family member or business client, I listen for clues they give such as when they comment on their love of dark chocolate or how they wish they had _______(fill in the blank). 3. Keep your eyes peeled – now that you've made your list of things your family, friends, and employers like, you can now be on the lookout for those things throughout the year. For example, if you find a wine that you especially like, buy a case and give bottles to your vino loving friends as their birthdays come up. Or, I have a friend who has a wicked sense of humor. Since I know her so well, I'm constantly searching for funny things during my travels and I collect them and store them until the next gift giving opportunity. 4. Is it a Gift or a Present? – a very important difference! A gift is something you get that the other person likes. You don't necessarily need to like it. A present is something you get that you like and you hope (or don't care) the giftee will like as well. 5. Always have a backup – when I see kids' toys that are very unique and affordable, I buy a few so that I'm not out running to the toy store on the way to the birthday party. Candles, wine, and birthday cards should always be on hand for a last minute hostess gift or "oops I forgot" gift.